We’d love your help. Let us know what’s wrong with this preview of Vlucht van de nachtraven by Raymond E. Feist. De vlucht van de nachtraven begint twee jaar na de gebeurtenissen in De terugkeer van de banneling. Puc, de machtigste magiër die ooit leefde, ondergaat een nachtmerrie waarin hij opnieuw de storm beleeft waarmee magiër vele jaren geleden zo aangrijpend begon. Deze keer weet Puc niet aan het ziedend stormgeweld te ontkomen. In plaats daarvan wordt hij overspoeld door een im De vlucht van de nachtraven begint twee jaar na de gebeurtenissen in De terugkeer van de banneling. Puc, de machtigste magiër die ooit leefde, ondergaat een nachtmerrie waarin hij opnieuw de storm beleeft waarmee magiër vele jaren geleden zo aangrijpend begon. Deze keer weet Puc niet aan het ziedend stormgeweld te ontkomen. In plaats daarvan wordt hij overspoeld door een immens grote duistere vloedgolf die heel Midkemia dreigt weg te vagen. Als hij met een schok wakker wordt, beseft Puc dat de droom voortkomt uit zijn angst voor de Dasati, een machtig ras afkomstig van ver buiten Midkemia, dat ook in werkelijkheid een heuse bedreiging vormt. To ask other readers questions about Vlucht van de nachtraven, please sign up. The first thing I understood by reading the first part of this trilogy is that the author when he was writing this book did not had many fresh ideas to get it started. The beginning of history takes us to a peaceful place where two young men without having anything specific to do finally leave to engage in an espionage case, just when is ascertained that a great evil threatens the universe. Of course, all of this reminds us something, but better to go further because things are getting more inte The first thing I understood by reading the first part of this trilogy is that the author when he was writing this book did not had many fresh ideas to get it started. The beginning of history takes us to a peaceful place where two young men without having anything specific to do finally leave to engage in an espionage case, just when is ascertained that a great evil threatens the universe. Of course, all of this reminds us something, but better to go further because things are getting more interesting there. Then we return to our well-known heroes from the previous books, and from that point on they are guiding the plot. But things are not improving remarkably, as the lack of originality continues to torment us, with theological discussions that recycle the same issues, the pitfalls they face in a spectacular way, and the magical end that leaves promises for the sequel. To be fair, of course, all of this means that there are many of the elements that make this whole series special, with humour, debates about good and evil, the little dose of emotion where it should, the action that escalates in end. I just waited for some surprise, which would lead the story to different paths and I did not find it. This was actually the first Feist book I've read and I think it serves as a great introduction to anyone who also hadn't read his other works. Nighthawks still remains one of my favourite Feist books too. Feist's Darkwar Saga is starting out better than his Riftwar. So it is set in the future. Pug is now old and his first wife, whom I liked, is gone and he has married the annoying shrew Miranda for some reason. But the true story is about his sons now- Caleb, a non-magical boy, and his brother Magnus, a powerful magus. In the Kesh Empire something strange is happening. Nobles are being killed off and there are rumors of a secret group operating out of the shadows. The story revolves around Pug and Feist's Darkwar Saga is starting out better than his Riftwar. In the Kesh Empire something strange is happening. Nobles are being killed off and there are rumors of a secret group operating out of the shadows. The story revolves around Pug and his sons banding together to go to Kesh and root out this mysterious assassin's guild known as Nighthawks. Fast paced and entertaining I enjoyed this first book in this series. The character of Bek shows real promise and this "fragment of the Namless One" is rather interesting. The Nighthawk operation and the efforts of Pug and his Conclave were well done. A good first book in this trilogy. Flight of the Nighthawks has a good narrative that flows rather nicely. However, the plotline is one of Feist's weaker works, resulting in a somewhat meandering and, in the end, cliched style. The book begins focusing on the two boys, Tad and Zane, though somewhere along the line, Feist seemed to forget about them, leaving me wondering why he introduced them in the first place. Identifying a main character toward the end seemed rather difficult as it seemed to be spread out over numerous characte Flight of the Nighthawks has a good narrative that flows rather nicely. However, the plotline is one of Feist's weaker works, resulting in a somewhat meandering and, in the end, cliched style. The book begins focusing on the two boys, Tad and Zane, though somewhere along the line, Feist seemed to forget about them, leaving me wondering why he introduced them in the first place. Identifying a main character toward the end seemed rather difficult as it seemed to be spread out over numerous characters. While incorporating a number of different main characters into a storyline is not a poor writing technique, it fails here primarily because Feist seemed to have the two boys in mind, then changed his mind or became too involved with other ideas to continue with them. Therefore, they simply don't hold the book together. The thrust of the series also seems to have devolved into a simple chasing after Leso Varen, an all-too-familiar plot of one evil wizard threatening the world and a race to stop him. While the threat of the talnoy and Dasati remain, they are relegated to the background. Even the return of the nighthawks, the very threat for which the book is titled, are not particularly threatening and seem only a rung on the ladder toward Leso Varen. For that matter, when dealing with the nighthawks, unlike in A Darkness at Sethanon, there was no real sense of danger. I felt little apprehension at the characters' activities when chasing after a guild of assassins, a deadness that seemed inappropriate. Finally, the concluding chapters were simply cliche. While Feist took pains to never directly mention what the characters had come to conclude about Varen's hiding place, it was rather obvious and particularly unoriginal. For the author to drop mention of Kaspar and Tal and others' knowledge while not disclosing it to the reader, as if it were to be a great surprise and leaving the reader on the edge of his seat, was simply trite at the reveal. Both more subtlety and creativity was warranted. Wow, Raymond Feist is really phoning it in here. Feist is one of my guilty pleasures as far as books go, and only one of two high fantasy authors I read everything from any more (the other one being George R. R. Martin). That may have to change, though. Flight of the Nighthawks really isn't all that well written, what with half the characters using idioms straight out of the 20th century and with clumsy and distracting phrasing that any editor should have been able to catch. It seems pretty clear Wow, Raymond Feist is really phoning it in here. Feist is one of my guilty pleasures as far as books go, and only one of two high fantasy authors I read everything from any more (the other one being George R. R. Martin). That may have to change, though. Flight of the Nighthawks really isn't all that well written, what with half the characters using idioms straight out of the 20th century and with clumsy and distracting phrasing that any editor should have been able to catch. It seems pretty clear that Feist wants to write something in another genre, but can't make himself or is just fulfilling some contract. Two of the characters even get drunk on whiskey (a far cry from the staples of ale or wine) and one of them owns a restaurant. I'm not against breaking out of the mould, but Feist's really not doing anything interesting with it; it's like he's breaking the rules out of bordom, not creativity. The book doesn't even have a very interesting story, unlike previous installments in this new series. The pacing is completely bizarre, the characters are uniformly uninteresting, and Feist can't seem to let go of old standbys (though that's probably just as well, since his new characters are unremarkable). Oh, and everybody gets a plotline in this book. Magnus? He's got one. Pug? One for him. Nakor? Caleb? Tal Hawkins? Kaspar? Yep, all got their own private plotlines. Miranda? Well, no --she's a woman and for some reason Feist doesn't write women. Just as well, though. And it's not like all these threads weave together in any significant way. It's practically the SAME overall story as the last book --cliched, mad magician disguises self and tries to take over the world only to be suddenly stoped by a party of high level characters once the page count hits a certain mark. Bleh. Er is iets vreemds aan de hand in Kesh. Nobelen worden er vermoord, en er gaan geruchten over een groep mensen die zich in de schaduw ophouden. Puc en zijn twee zoon Dit verhaal speelt verder in de toekomst dan 'De oorlog van de grote scheuring'. Puc is ouder geworden, en zijn eerste vrouw is al lang geleden overleden. Hij is nu getrouwd met Miranda, de dochter van Macros. 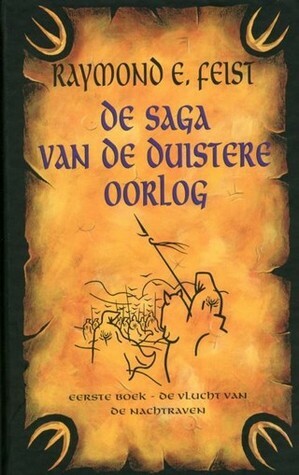 De hoofdrollen zijn echter vooral weggelegd voor hun zonen, Magus, een grote magiër, en Caleb, die geen magische geven heeft. Since it reads a bit like an extended synapses of every other book the author has ever written, I am forestalling definitive judgement until I read his first book (or possibly books.) However, since the author's focus seems to be equally divided between the books plot and his past accomplishments, it's quite likely my rating will go down. Amendment: I was correct in my assumptions. This book is equal parts fan service "Hey remember when that character did that cool thing you liked," intermixed wi Since it reads a bit like an extended synapses of every other book the author has ever written, I am forestalling definitive judgement until I read his first book (or possibly books.) However, since the author's focus seems to be equally divided between the books plot and his past accomplishments, it's quite likely my rating will go down. And the honour of my first 1 star review goes to.... this book.... something about Nighthawks... not really sure who they are still. Every fantasy cliche and the m And the honour of my first 1 star review goes to.... this book.... something about Nighthawks... not really sure who they are still. Every fantasy cliche and the most obvious plot twist to boot... have enjoyed fantasy in the past but never read Feist before. Didn’t mind the writing style and description but seriously there was no character development for all that wordiness and nothing happening... not a quitter otherwise I would have ditched it. An inauspicious start to this trilogy... Feist has this down to a formula, with strict ingredients and instructions. A standard trilogy starter, with cardboard characters and a generic plot. Pug, Miranda, Nakor and Tomas take their usual turns in this fantasy, without much reminding us of why we liked them to begin with. Leso Varen, the mad mage from the previous trilogy, is back and madder than ever. This is a guy who can't die! Some cheap theatrics and poorly written intrigue with the court of An inauspicious start to this trilogy... Feist has this down to a formula, with strict ingredients and instructions. A standard trilogy starter, with cardboard characters and a generic plot. Pug, Miranda, Nakor and Tomas take their usual turns in this fantasy, without much reminding us of why we liked them to begin with. Leso Varen, the mad mage from the previous trilogy, is back and madder than ever. This is a guy who can't die! Some cheap theatrics and poorly written intrigue with the court of Kesh lead us to giant plot holes and inconsistencies that will take us through the rest of this muddled mess. Unlike some of his earlier novels, this one is a fast paced and fast moving tale, with plenty of excitement. But where is our love for the characters? It is simply not there. How many times can Nakor grin after every sentence? How many times can characters shrug nonchalantly? It gets irritating. Pug is completely lost and confused in this book. For being the leader of the Conclave, and manifestly the most important, most knowledgeable and most powerful magician in the universe, Feist doesn't give him much to do, and certainly makes him an idiot compared to the Pug of the Riftwar. It is a travesty to see major fantasy figure like Pug reduced to this. Magnus, Jommy and the rest of the "kids" are poor imitations of Jimmy the Hand and others. Pity that Erik von Darkmoor of the Serpentwar Saga actually seems like a complex and interesting figure compared to these people. However, the story moves along quite rapidly and Leso Varen is entertaining in a silly kind of way. As the most powerful necromancer in the world, all he could produce was some black flame and a scary voice. Sheesh. The Dasati are appropriately frightening but they don't measure up to the dread we felt at the entrance of the Tsuaranni so long ago. More's the pity. a good start to a new series- good setup for the next novel. this is not a series that somebody fresh to feist world can pick up- alot of references to previous books and characters. Three things. First, someone should rewrite the preface. This isn't really a story of brothers or assassins. It's more politics and sorcery. Second, this book is alright. It's nothing great, but narration flows nicely and the anticipation to the climax is steady. Third, as warning, as I found out, this book is the first of a saga, but is not something brand new. There are more works, more story already built into the world this story takes place in. My favorite fantasy author of all time. It's just a joy to read his work, as he continues the story of Pug, and totally keeps you hanging on by having Pug, many books ago, told everyone around him, his loved ones, would die. Amazing character development. More like 3.5 stars really. A breezy read, interesting without being overly deep. Quite enjoyable, but with many, many jarring typos. The editor of this edition was asleep at the wheel. Down to Great Kesh we go again. Which is great because the last time I remember was 12 books ago. I LOVED the first chapter of this. Hopefully without spoiling too much, it’s a recreation of the previous part of the series, and I really enjoyed reading it. This book delves a bit more into Pug’s family, which I like as I felt Magnus and Caleb sort of just appeared one book, and I don’t know very well. Which is sad considering this world has so many books. A few new characters are not particularly i Down to Great Kesh we go again. Which is great because the last time I remember was 12 books ago. I LOVED the first chapter of this. Hopefully without spoiling too much, it’s a recreation of the previous part of the series, and I really enjoyed reading it. A few new characters are not particularly interesting as they feel similar to others, but are still enjoyable to read. There are references to characters and plot points of Prince of the Blood (the 12 books ago one) that I didn’t get as it was so long ago that I visited that story, so I reread of that might make this better in parts. I finished reading this book about a year ago, and I enjoyed it, but, in retrospect, I don't understand why. So many random things happen in the book, the two main characters seem forced and are completely uninteresting, and the world that the book is set in is basically the most cliché thing ever (view spoiler)[(Midkemia is a bad name... why is the Kingdom's name just 'the Kingdom'? Couldn't he think of anything better? Empire of Great Kesh? What now? Oh, there's a magical island with wizards on I finished reading this book about a year ago, and I enjoyed it, but, in retrospect, I don't understand why. So many random things happen in the book, the two main characters seem forced and are completely uninteresting, and the world that the book is set in is basically the most cliché thing ever (view spoiler)[(Midkemia is a bad name... why is the Kingdom's name just 'the Kingdom'? Couldn't he think of anything better? Empire of Great Kesh? What now? Oh, there's a magical island with wizards on it. And elves and dwarves in other instalments of the series) (hide spoiler)]. It's been a while since I've visited the worlds of Feist. His books continue on his established history, with characters ageing and dying (or both) and others coming and going from the narrative. This one was interesting as it seemed to flesh out the Empire of Great Kesh a little more and gave an insight into its politics. Yet at the same time it seemed very pedestrian, like Feist is going through the motions without having any real inspiration. Not a bad opening number for a trilogy but not part It's been a while since I've visited the worlds of Feist. His books continue on his established history, with characters ageing and dying (or both) and others coming and going from the narrative. This one was interesting as it seemed to flesh out the Empire of Great Kesh a little more and gave an insight into its politics. Yet at the same time it seemed very pedestrian, like Feist is going through the motions without having any real inspiration. I only managed to get to page 258 before I truly stopped caring. I'm counting this as finished. This writing style doesn't work for me, and to be honest, I couldn't care less about the characters. Dont get me wrong, its not awful, I did manage to get over half way. But then I put it down one day and its been months since I even bothered to pick it back up. I tried again tonight and I just don't care enough to keep trying. 2. bohaterowie są jakoś tak nijacy. Niby ich jest dwójka, a nie potrafię ich rozróżniać po charakterze. To jest jedna i ta sama osoba. W zasadzie mogła to by być jedna osoba, jeden bohater, a nie niepotrzebna dwójka! Quite like this one, though it does feel a bit rushed at times. We spend a lot of time with Caleb (Pug's son) and his adopted sons Tad and Zane investing the doing's of Leso Varen in Kesh, where he is hiding after the fall of Olasko. Always a fan of Pug this book is carrying on the tradition of good stories. A great new fantasy series. All the references to previous books slowed it down a bit and I read those books. But if you ignored those passages the story was great and Pug is always a winner. Caleb adopting 3 boys and getting married was a bonus. It's been a fair few years since I last spent time with Pug and the gang so it took a little bit of time to remember who was who. This particular book isn't a shining example of fantasy, nor is it a stand out performer within the Magician series but it's a familiar, fast-paced, enjoyable story nonetheless. I'm inclined to suspect this was when Feist stopped returning his editor's phone calls. The book is disjointed and takes in too much. It feels like a live album where the band were too drunk to remember how their greatest hits went. I enjoyed this book, however, it was a bit disappointing to realize that the writing took the turn of "I just don't want to get rid of the bad guy yet". I love the characters however, so I will continue the series. This book picked up towards the end, but for much of it, it felt like Feist was mailing it in. It's the first of a trilogy, so we will see how it plays out. It was okay, could have been better.